DICKENS, Iowa -- Melanie Lekwa of Spencer was annoyed when she opened her parents' mailbox earlier this month and found a Gatorade bottle leaking fluid all over the bottom of the box. Disgusted, she grabbed the bottle and threw it onto the ground. "I thought some stupid kids put trash in the mailbox and actually I was right," Lekwa said later. Sort of. It also was an unexploded bomb filled with muriatic acid, a corrosive chemical that five teenagers had stashed in the box the night before Lekwa opened the box. Five teenage boys, 15- and 17-year-olds from Iowa towns of Ruthven and Ayrshire, face charges for allegedly damaging or destroying 17 mailboxes with baseball bats, a seven-iron golf club and the homemade bombs. Police say no one was injured by any of the bombs, left in the mailboxes in early March. A sixth teenage boy and 18-year-old Tyler Enderson of Dickens face charges for destroying boxes with baseball bats. But what might seem like a teenage prank, even a rite of passage in rural Iowa, isn't what it used to be. An increased focus on national security after the Sept. 11, 2001, terrorist attack on the World Trade Center, has federal officials, who investigate any crime dealing with mail tampering, taking the use of explosives seriously. Karrie Sawicki, spokeswoman for the Federal Bureau of Investigation's Omaha Field Office, said federal officials don't assume homemade bombs are just kids trying to have fun. Officials say such crimes could be acts of domestic terrorism, intended to hurt or frighten a specific person or meant to send a political message. "They don't look at it as, 'Oh it's just kids blowing up mailboxes,'" Sawicki said. Clay County Attorney Michael Houchins, who is prosecuting the case, agrees. Years ago, incidents used to be handled informally. Now, underage offenders will at minimum face charges through the juvenile court system. If someone plants a bomb that hurts or kills someone, even if they didn't mean to, Houchins said they could face assault or involuntary manslaughter charges. Chief Deputy Duane Bates of the Clay County Sheriff's Office said the same crimes weren't seen as a big deal years ago. He said those who got caught faced, at most, a mild reprimand. "It was nothing to go beat a mailbox in the 1980s when we were kids," Bates said. Now, using explosives can result in extremely harsh penalties. Possession of an explosive device is punishable by 30 years in prison. Instructing another person how to use an explosive device is punishable by 20 years in prison. Local authorities such as the Clay County Sheriff's Office may be the first responders, but Bates said they won't be the only ones investigating the crime. The U.S. Postal Inspection Service and the Iowa Fire Marshal's Office assisted with the Clay County investigation. They were joined by volunteer firefighters from Spencer and Dickens, as well as Spencer police. Postal authorities halted mail service and police announced through the local radio station that residents should not get their mail. Together, the authorities checked more than 1,100 mailboxes on 110 miles of road before giving the all clear. Bates said the teens will likely be charged $45 each for the 37 mailboxes they allegedly damaged or destroyed. U.S. Postal Inspector Samuel Owens said penalties are harsh for a reason -- the potential for injury. Teenage pranksters are not professional chemists. They could hurt themselves, which Owens said they rarely seem to realize, or someone else. "What happens if the device doesn't go off and a little kid goes out and checks the mail?" Owens said. He said large-scale destruction of mailboxes, as opposed to one or two at a time, is cyclical and usually happens around spring break. Even though there have been several incidents this month involving homemade bombs used on mailboxes, including near Des Moines and in Cedar Falls, Owens said it's been an average year. The U.S. Postal Inspection Service investigates 30 to 40 incidents a year in Iowa. Of those, Owens estimates about 20 to 30 involve some sort of improvised explosive device. "It's normal to have more around spring break," he said. 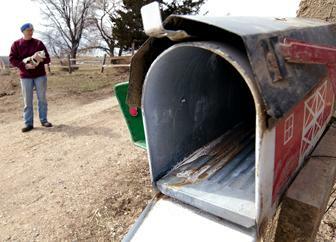 All the Clay County boys originally faced federal charges, which carried penalties of up to three years in prison and a $250,000 fine for each destroyed mailbox. Clay County Prosecutor Michael Houchins said because no one was hurt and the boys and their parents were cooperative, the underage teens will be processed through juvenile court on much lesser state charges of third-degree criminal mischief and/or reckless use of an explosive. Enderson, who will be tried as an adult, will face one misdemeanor charge of third-degree criminal mischief. Clay County police say their counterparts in Palo Alto County may be arresting an eighth person, who will be charged with supplying alcohol to the teens. Authorities believe alcohol was a factor when the boys, who traveled together in two cars, allegedly drove down about 15 miles of county roads, bashing or attempting to blow up mailboxes as they went. The boys allegedly started out bashing boxes south of Dickens with bats and a golf club. Bates said they changed their plans at some point and went into Spencer to buy plumbing cleaner and aluminum foil. The object was to have fun, Bates said, not to hurt anyone. "They went right out to the same area and stuck the bombs in the mailboxes they didn't hit," Bates said. The ingredients cause a chemical reaction that forms a gas, which bursts the bottle to relieve the pressure. The teens didn't have the formula quite right, Bates said, so many of the bombs didn't actually explode. Some, like the one at Lekwa's parents farm, merely leaked corrosive acid on the boxes. Lekwa and her father, Robert Rusk, don't believe the teenagers who stuck the bomb inside their mailbox are bad kids. They know some of the families and strongly suspect Rusk's wife, Nira, taught at least one of them in elementary school. They hoped the kids learned their lesson. In addition to Lekwa, police say a mail carrier also inadvertently handled some of the unexploded bombs. "They didn't know when it was going to explode," Lekwa said. "Plenty of people had these things in their hands."